Recipe 28:This Halloween i really didn’t have the time to organize a fancy dress party and not even a real Halloween menu, but i have still invited some friends at home. So i simply decided to stick to the orange as an Halloween theme and i made pasta with pumpkin and mushroom, and this double color souffle that i always loved. Very delicate in the taste, it’s made by vegetables and besciamella sauce mixed together. Here are the ingredients: 500 gr. of frozen chopped spinach, 250 gr of carrots, 50 gr of butter, 3eggs, 30 gr Parmesan, 50 gr flour, 300ml of milk, salt, nutmeg. Wash, peal and boil the carrots. When ready cut them finely and place it in a pan with 25gr of butter. In the meantime, boil also the chopped spinach and when ready, drain them and leave it in one side to cool down. Add to the carrots 25gr of flour and 125ml of milk and mix it all for around 10 minutes, or until it gets thick. You will create in this way a light besciamella that you will need to let cool down after adding the 15gr Parmesan, the salt and nutmeg. When the spinach are cold, add a yolk egg and mix. In another pan you will prepare some more besciamella also for the spinach: 25gr butter with 25gr flour and around 150-200ml of milk. Stir all until it get thick and when a bit cold, add it to the spinach with 15gr Parmesan and some salt. Add to egg yolk to the carrots too and put all the white parts of the egg to whip up in the mixer. 2 parts of this will need to go in the carrots and one part in the spinach. Now let’s prepare the backing pan putting some butter on the inside, covered in flour to don’t make the souffle’ stick. Place the spinach mix first and then the carrots one. At this point my mum use to cook this in teh oven but a “bagno maria” so in another conteiner with boiling water. In this way the souffle is not in direct contact with the hot. I didn’t have any other big container so i place it in the oven at 200 degree for one our with a bit of pieces of butter on the top. It was really good anyway…maybe a bit harder than a souffle’, but still easy and nice. When the souffle’ is cooking, don’t open the oven or it will collapse. When you think is ready, try a tooth pick in the inside and if it’s dry, you can directly turn it on a plate and serve it. If you will wait it will collapse again. So serve it hot straight away. I added some Parmesan but also without it’s very good. Enjoy! PS. Beh mamy non m’e’ venuto male anche se non l’ho cotto a bagno maria no? Il problema e’ che per farlo staccare dal recipiente ho aspettato e come volevasi dimostrare mi s’e’ ammosciato e la parte arancione quasi non si vede. Ma che buono! Recipe 48: finally for ferragosto I decided to prepare also a quiche with spinach, another classic in my mother parties preparations but this time I changed it a bit and I was very happy with the result! Ingredients: 1 packet of shortcrust pastry, 450gr of frozen spinach(in buy best they have it), 150 gr mascarpone, pepper, 2 eggs, salt, just a bit of pancetta (40 gr) and nutmeg. Boil the spinach in salty water and wait for them to be cooked. When ready, drain them very well, taking of all the water. Prepare the baking pan with some baking paper or butter and flour as usual. Then place the pastry in the pan after having alredy stretched it in a flat round form. Mix the spinach with the mascarpone, the eggs, the salt, papper and nutmeg, adding a bit of pancetta already slightly cooked without oil. Here is the main difference with my mum’s one, made with ricotta and some pieces of frankfurts. Place the mix in the pastry and adjust the borders to contain perfectluy the filling! Place it in a prehitted oven at 200 degrees for around 30 40 minutes. Check with a tooth pick if inside the quiche is cooked and be ready to eat! Buon appetito! 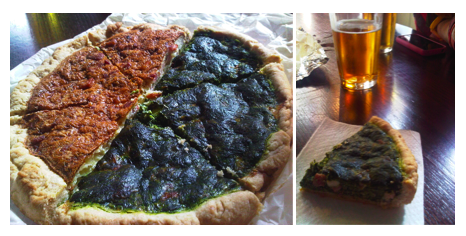 PS: Mamy ho fatto anche la tua quiche con gli spinaci, ma non ho trovato la ricotta percio’ ho usato il mascarpone,mentre in cambio dei wurstel ho preferito dargli piu’sapore con la pancetta! Mi hanno detto tutti che era ottima! Recipe 91: Today i will give you the chance to bring some new life in your dinner vegetable portion…the classic one and sometime only a day! Here is a super simple recipe my mum use to cook for me when i was little. It was the only way to let me eat vegetable and especially spinach!… I have always prefered Olivia to Popeye (Braccio di ferro in italian)! Ingredients: just some frozen or fresh spinach, milk, butter, raisins and pine nuts if you like them. I was just speaking about frozen spinach because to boil them and have a good quantity after, you need to use kilos of spinach. Instead if you find the frozen ones, you can just put them in teh water and the dish will be good anyway. Another little problem is that in England no one sell frozen spinach and i have never understood why! Why you can have frozen peas, broccoli, potatoes, carrots but not spinach? However i will tell you a secret: try to look for them in some 24hours managed by indian…they seems to be the only clever people to use frozen spinach to cook and they saved my recipes! By the way just put some of them in some boiling and salty water and let them cook. In another pan put some butter and when the spinach are ready, drain them and put them in it. Mix everything and add some more butter if you think you need. Then add some milk and some other salt and pepper if necessary. Leave them absorb the milk and the butter and serve in a plate with some Parmesan, raisins and pine nuts if you like them. PS. Ciao Mamy e chi se li scorda i tuoi spinaci con il latte? semplici e buonissimi per cambiare un po’ la routine serale. Noi li abbiamo cucinati senza uva passa e pinoli perche’ a me piacciono piu’ al naturale, ma penso che il connubio non sia male. Non sai che delirio per trovare gli spinaci surgelati…, ma alla fine ce l’ho fatta! Recipe 100: this is another italian classic and for my french friend’s birthday party we choose to have something ready to hot up in the oven and to eat with the guests directly with the nice french quiches she made… the italian answer to that can just be cannelloni! The ingredients for 4 people are: 300 gr of boiled spinach (I suggest you to buy some frozen ones), 350 gr. of ricotta, 1 box of cannelloni pasta from Sainsbury’s or 8-10 lasagne, nutmeg, salt, a bit of olive oil, 2 sage’s leaves, 80-100 gr of Parmesan and then the ingredients for the besciamella that you can find here. You can start preparing some Besciamella: put the butter, flour and milk in a pan and mix until they become a cream. Add some salt and nutmeg before it’s ready and then put it in a large container. Put on the fire some water for the lasagne and in the meantime cook or defrost the spinach, add the sage leaves cut in little pieces, and then pass them in a hot pan with some olive oil, salt and pepper. Cook them a bit, just to give some more taste and leave them there until cold. When the water is boiling, you can put 2 or 3 lasagne to cook at the time. Waiting for them, you can mix together in a bowl the ricotta, 20 gr of Parmesan, the boiled spinach and a bit of nutmeg. The filling for the cannelloni is ready. Check the lasagne now and be very careful to don’t let them stick between each other. When these are ready just take them out and put in a plate to cool down. Put in the water other 2-3 and repeat the same. Waiting for the pasta to cool down you can add 40gr of Parmesan to the besciamella, mixing with a whisk and you can start to spread half of it in the baking pan where you will place the cannelloni. Remember it’s always better to put some butter before than the besciamella, just to don’t make the pan sticky. When the pasta is ready just put some spinach filling inside and roll up them to create a cannellone and place them on the pan. If you are using cannelloni pasta, just push inside the filling and place them on the pan. Keep on doing the same until the end and then cover it all with the besciamella remained before. At this point you will just need to cover it with parmesan and put in the oven for around 30 minutes at 200 degree for the lasagne and 40 minutes always at 200 if they are cannelloni ready to be filled but not precooked. PS. Mamy che buoni!!! pero’ dato il tempo risicato io non ho usato le lasagne ma i cannelloni gia’ proti da riempire che vendono qui. Lo so che tu li fai di piu’ con le crepe che vengono piu’ leggeri, ma devo dire che anche questi erano buonissimi. e poi la tua besciamella non ha rivali!